After almost four full seasons of contributing nothing, Jacksonville Jaguars coach Gus Bradley was let go after going 14-48 since taking the job before the 2013 season. Former Syracuse Orangemen and Buffalo Bills head coach Doug Marrone, the team's offensive line coach, will take over for the remainder of the season. 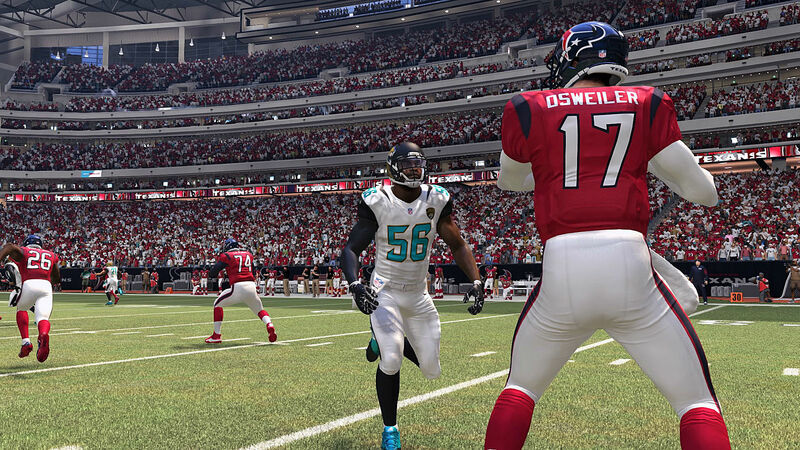 Whether you play as Gus Bradley in Madden NFL 17 or you create your own coach, you're most likely going to have better success than the former Seahawks defensive coordinator did. 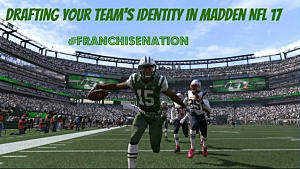 How, though, will you be able to turn this bottom feeder of a franchise into the contender that they should be? 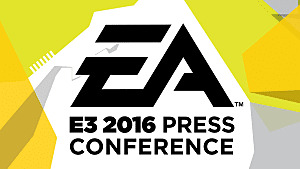 No, I'm not talking about draft identity... not yet, at least. A pass-heavy offense that sees Blake Bortles and Allen Robinson became a modern version of Peyton Manning and Marvin Harrison. Your offensive weapons are already in place receiver and tight end wise, but it's Bortles that you have to worry about (more on him soon). 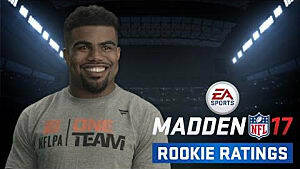 An offense that relies more on the running duo of T.J. Yeldon and Chris Ivory - in addition to whoever you scout and draft - like the mid-2000's New York Giants teams. Bonus points to you if, using Yeldon and Ivory, you can become only the seventh team all-time to feature two running backs with over 1,000 yards in a single season. 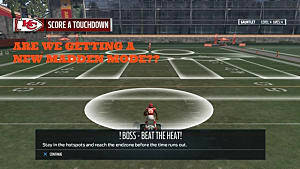 A defense which, in the style of powerhouses like the the early-2000's Baltimore Ravens or the current Seattle Seahawks capitalizes on a young defense. Here, you'll want to use guys like Jalen Ramsey, Myles Jack, and Dante Fowler Jr. to your full advantage. 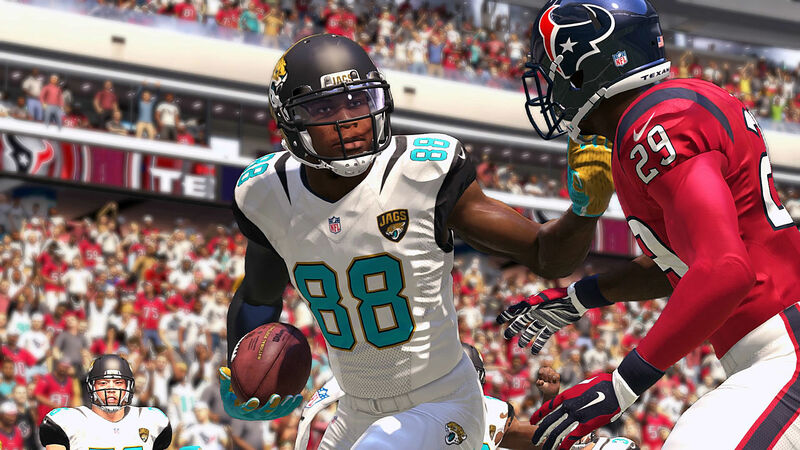 For the sake of this article, I decided to make my Jaguars team into more of a pass-heavy squad because the pieces -- Allen Robinson, Marqise Lee, Allen Hurns, Neal Sterling, and Julius Thomas -- are already on the roster. Obviously, I'd still put some focus into building up a defense, but I wanted to build a team that can blow teams out with the best of them. 2. 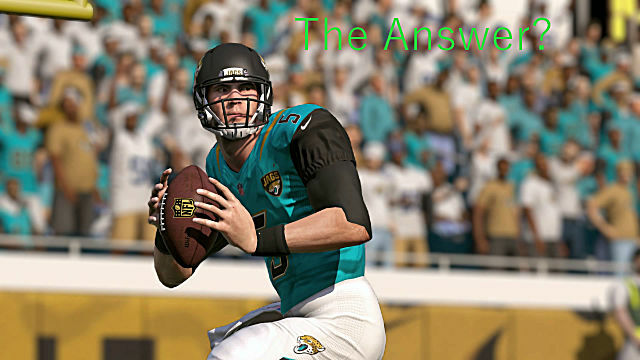 Blake Bortles: Saver Or Trader? ...don't even think about it, Jets. When you take over the Jaguars in Madden NFL 17, you're going to have a similar option on your hands: keep Bortles, or try to trade him. 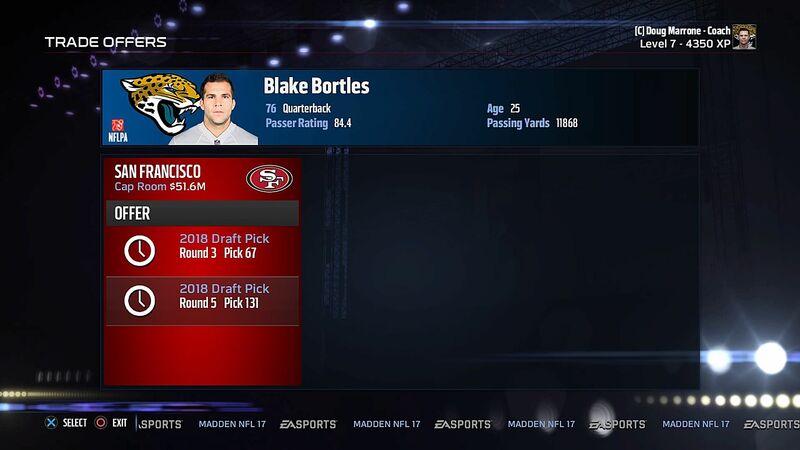 For my first season, I kept Blake Bortles around for two reasons; the first was I try to play as realistically as I can even when I'm doing something for an article, so trading Bortles after his real-life 2015 season would have been pretty unrealistic. The other reason, as simple as this one may have been, was that there wasn't much else I could replace Bortles with and my ideal asking price -- at least a first and a fifth-rounder -- wasn't going to happen for a 76 overall quarterback. Not yet, at least. So I kept Bortles around and watched as he led the Jaguars to a 9-7 record and an AFC South division title by throwing for 4,532 yards, a 35-19 TD-INT ratio, and completing 62% of his passes. It's a good season, but 22 total turnovers when his three fumbles are factored in is just not good enough. In your first year alone, guys like Paul Posluszny, Chris Ivory, Davon House, Julis Thomas, and even Mercedes Lewis can still fetch you a nice price by means of draft picks or young players. Unlike NBA 2K17 where trading a big-name guy can immediately land you something of substance, you have to usually work with finding something of substance by what you're given in a trade. 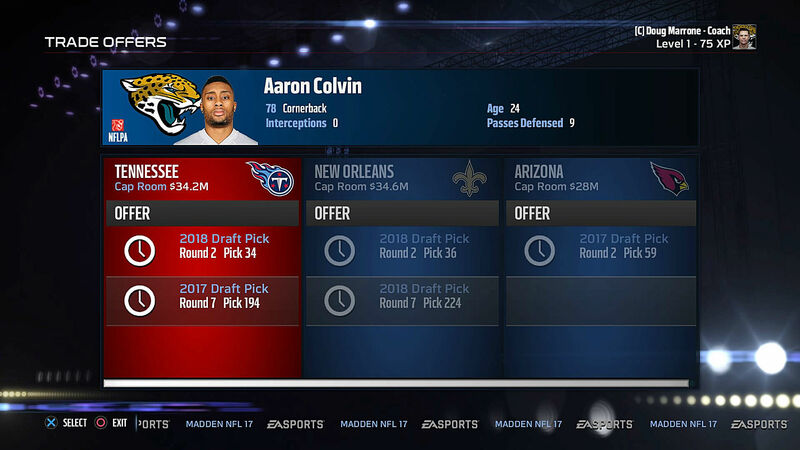 Take this trade I took in year one of my franchise, for example, involving cornerback Aaron Colvin. If I'm playing NBA 2K17, trading a 24 year old with a 78 overall could net me someone of the same mold (Jusuf Nurkic, anyone?) but here, I have to accept stockpiling draft picks. 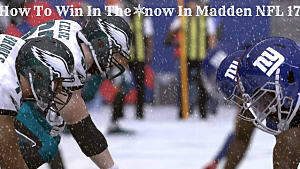 Keep in mind what happens with this pick, by the way. It's on you whether or not you want to begin a full rebuild and deal every big-name player, but you also have to ask yourself what that does for you in the short and long-term. Not every team can pull off a rebuild the way the Indianapolis Colts did -- and even then, look at how they've played the past two years. As you'd expect, everything I mentioned in the draft identity article still applies here, though you'll need to keep our first tip in mind. With the Jets in that draft article, I already knew their identity coming in - a team that had some playmakers on defense, which would be my focus, but needed a lot of help on offense - but you'll need to figure out Jacksonville's plan by the time you start scouting in week three. With Bortles' future in Jacksonville a mystery, I started scouting for quarterbacks because the chances of me finding a gem in free agency were low. On a team like this, Colin Kaepernick and Matt Barkley weren't going to cut it as starters. Honestly, my approach in free agency was what it always was: evaluate my needs, see who I could get cheap, and just focus on the draft ahead. 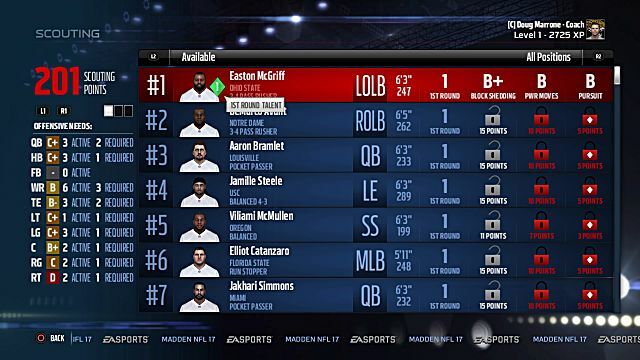 With so few standout offensive linemen available in the draft, I turned my attention to Eugene Monroe and Sebastian Vollmer for my tackles position and added a player here and there for depth. As tempted as I was to add a quarterback there for the sake of competition, Kaepernick -- the best option out there -- wasn't going to accept a cheap offer and he wasn't really the guy I needed. 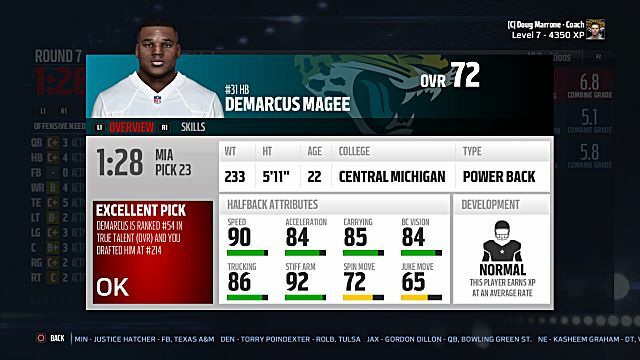 The offense I wanted to run needed a player with great accuracy traits, the ability to make plays on the run, and great durability. The truth is, I wasn't going to find that in the draft. Blake Bortles, for the time being, gets to stay. My priority in the draft would instead be finding a running back of the future I could develop alongside T.J. Yeldon, some help on the o-line, and taking the BPA (best player available) approach if I needed to. I've already explained pretty much everything you need to know about the draft in my identity article, so let's instead look at how some of my picks turned out. 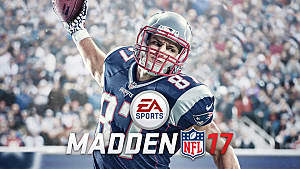 That Titans pick sure helped out! 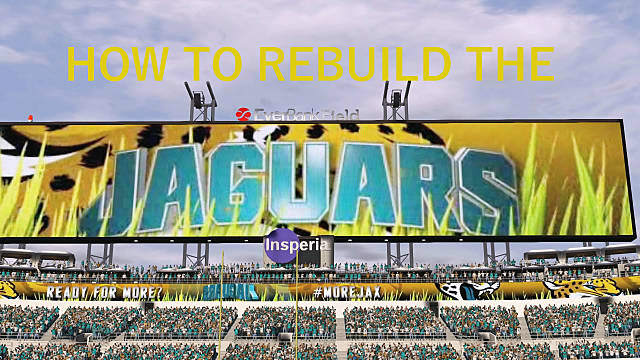 How do you plan on rebuilding the Jacksonville Jaguars in Madden NFL 17? Make sure to let us know in the comment section below!